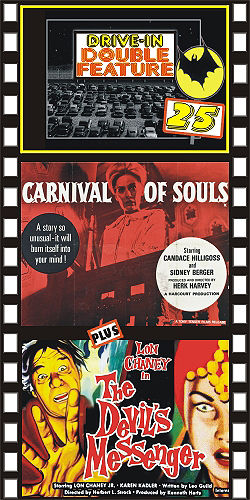 CARNIVAL OF SOULS (1962) Candace Hilligoss, Sidney Berger, Stan Levitt, directed by Herk Harvey. A must-see classic, trans-ferred from a top print. The survivor of a car wreck is haunted by a ghostly personage. Who is he, and why is he following her? Seldom have the elements of sight and sound come together in such an eerie, chilling way. A haunting, unforgettable film with a riveting pipe organ score. From 16mm. PLUS: THE DEVIL’S MESSENGER (1961) Lon Chaney, John Crawford, Karen Kadler. Lon plays Satan in this trio of horror stories. He sends his 'messenger' back to Earth with a formula for a 500 megaton nuclear bomb so that everybody can join him in hell. A bizarre film made up of three eerie episodes from a forgotten TV series called 13 Demon Street. From 35mm.